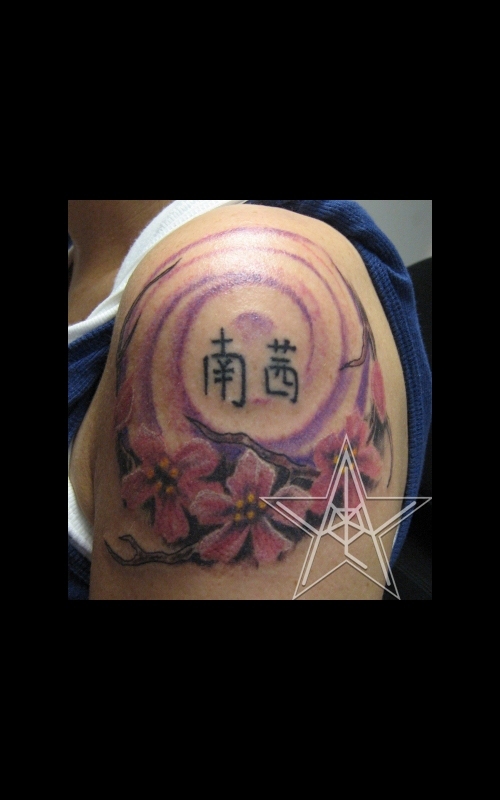 Blossom Wind Custom color cherry blossoms and kanji tattoo. 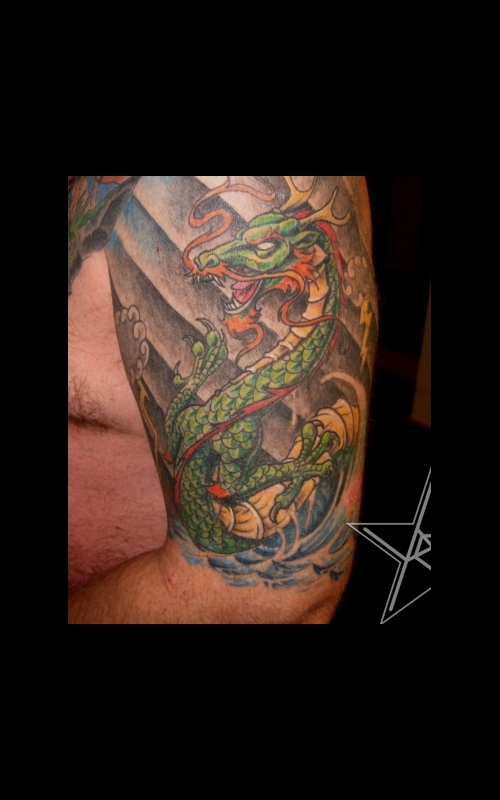 Dragonwater Custom color dragon tattoo. 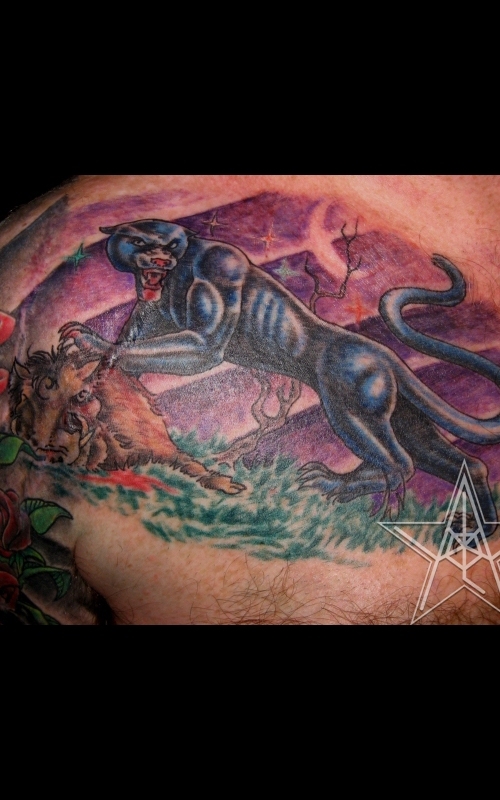 Over the Kill Custom color black panther over dead boar tattoo. 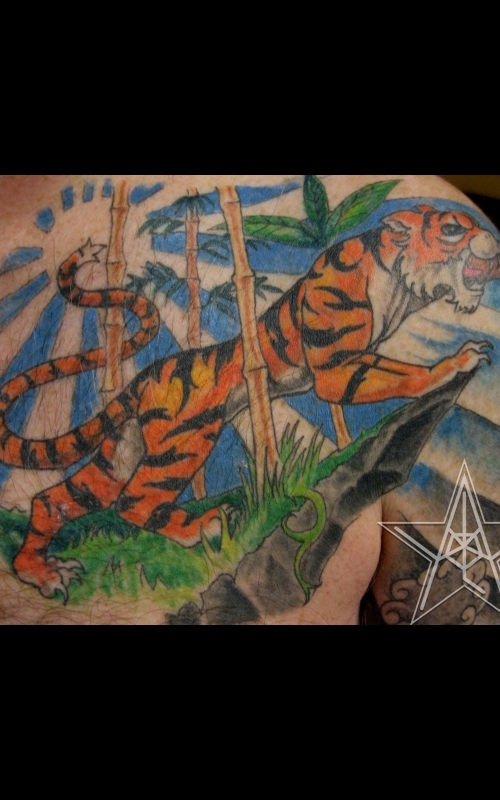 Tigersun Custom color tiger tattoo. Tigersun to Dragonwater Custom color tiger and dragon tattoo. 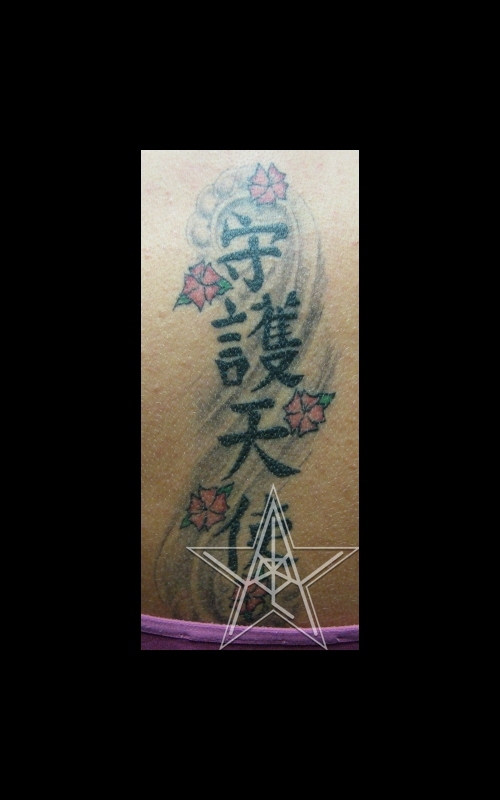 Kanji Blossomwind Custom color cherry blossoms and kanji tattoo. Kanjiwind Kanji and blossoms tattoo. 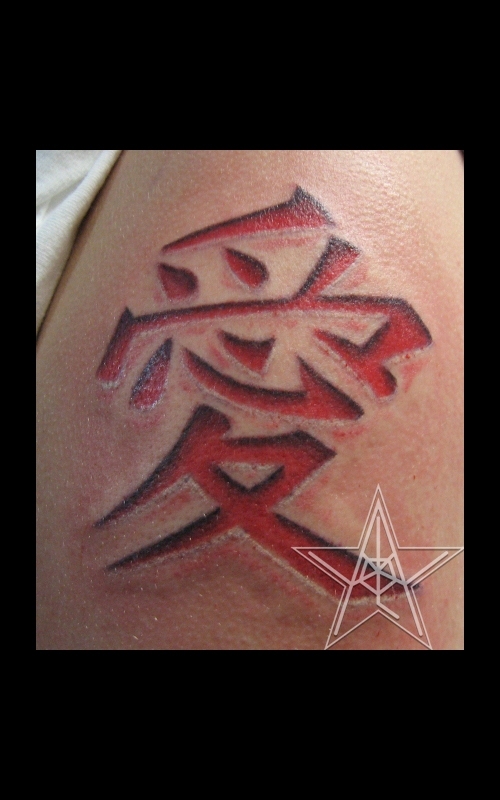 Kanji Cutout Custom color kanji cutout tattoo. 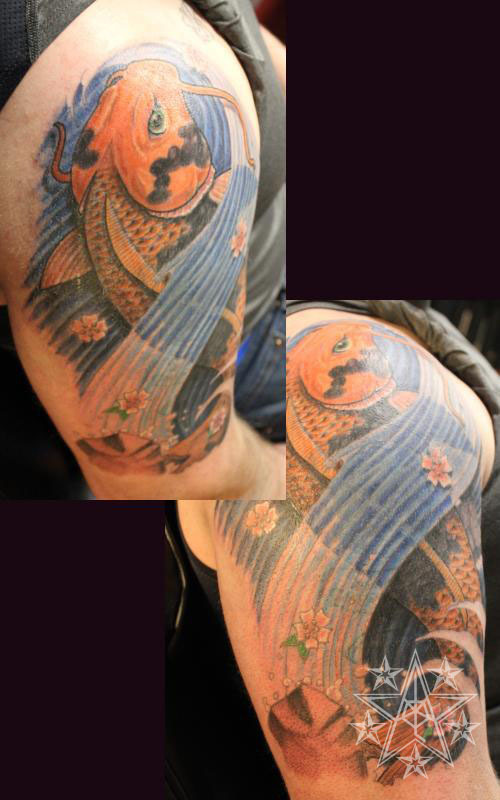 Back from the Mountain Custom color koi tattoo. 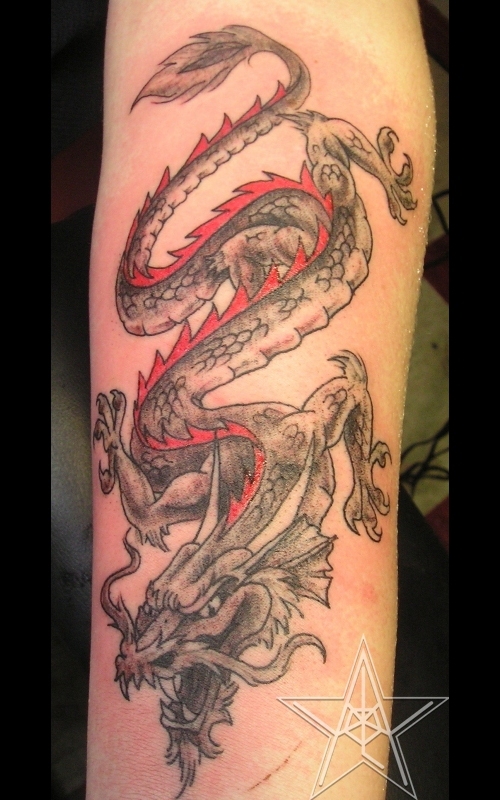 Motion Dragon Custom color dragon tattoo. 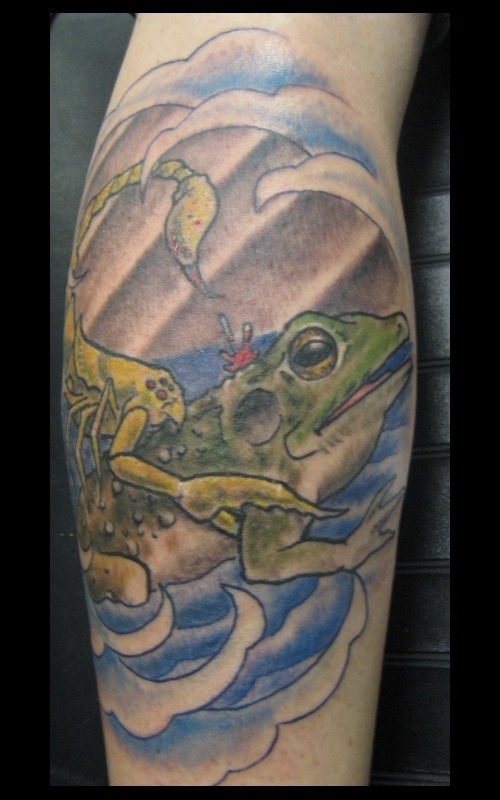 Scorpion and the Frog Custom color scorpion and frog tattoo. 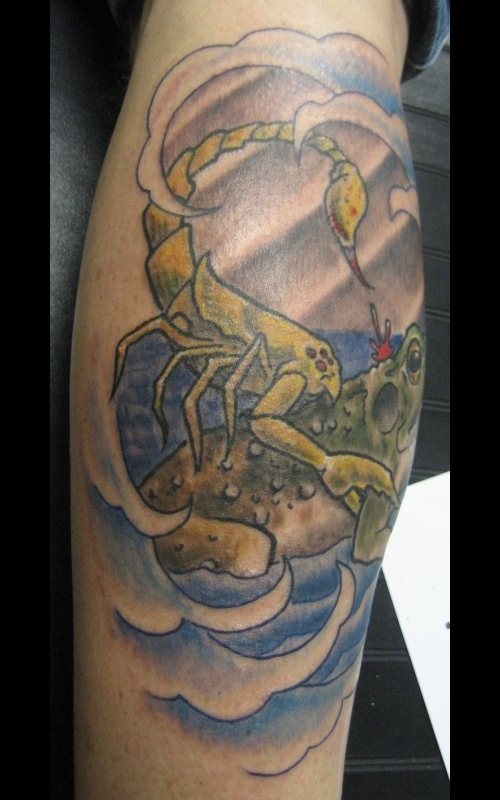 Scorpion and the Frog 02 Custom color scorpion and frog tattoo. 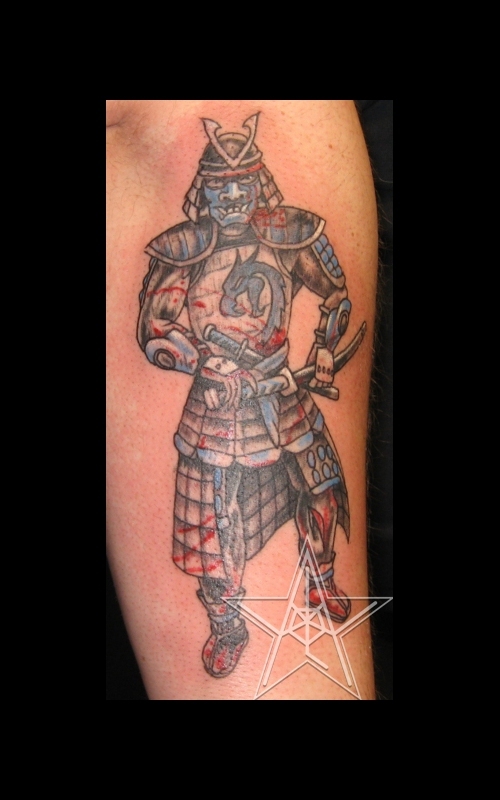 Honor in Death Custom color samurai skull with mask tattoo. Samurai Custom color samurai tattoo. 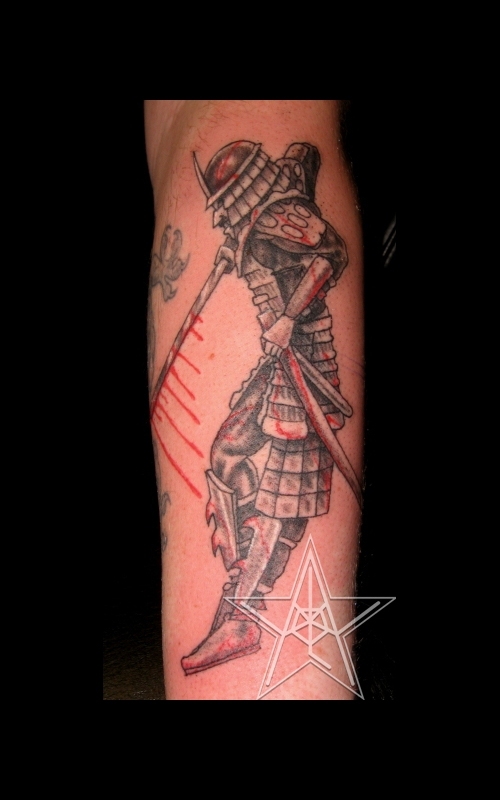 Bloody Samurai Custom color samurai tattoo. 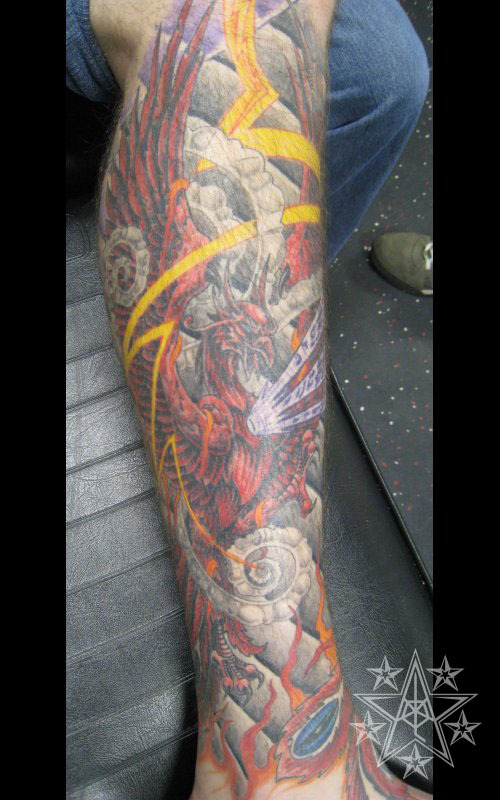 Entrance Custom black and grey dragon and tori tattoo. 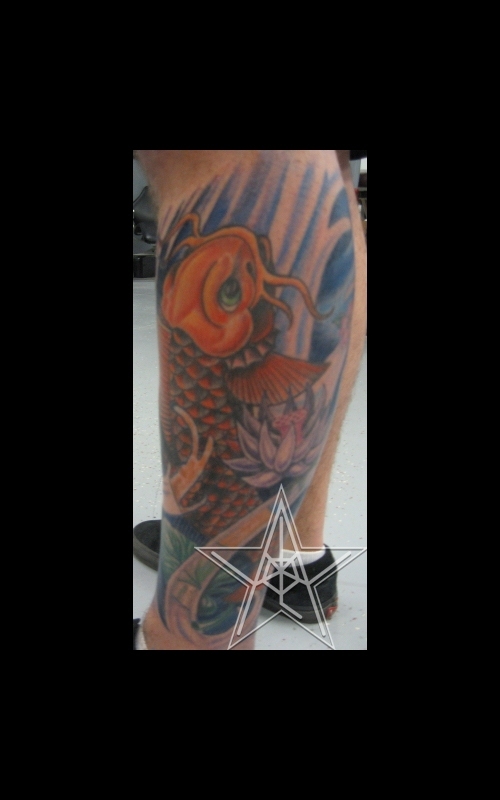 Quest for wisdom Custom color koi tattoo. 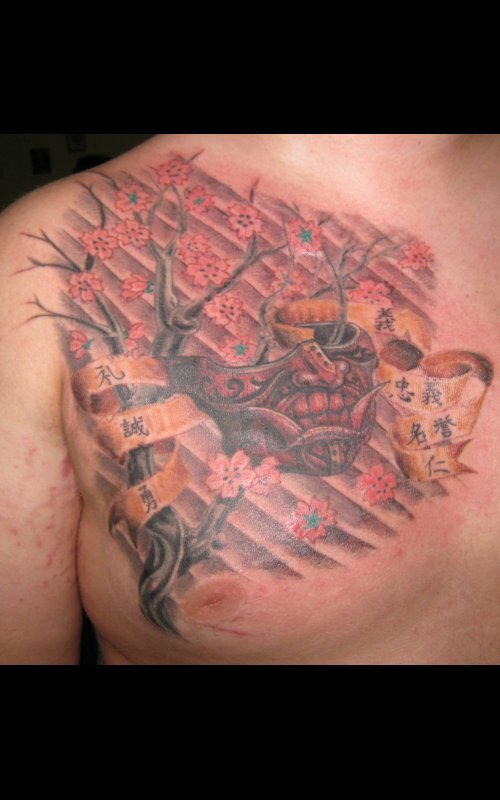 Bushido Tattoo of a samurai mask, in a cherry tree branch, with the Bushido code. 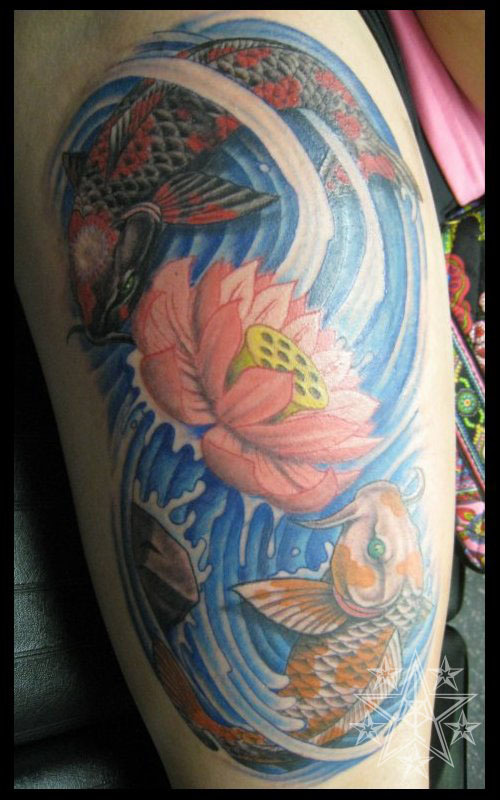 Double Koi Lotus Upward and downward swimming koi with lotus flower and water tattoo. Phoenix Stones 01 Asian phoenix with lightning, clouds, pillars, and light rays calf tattoo. 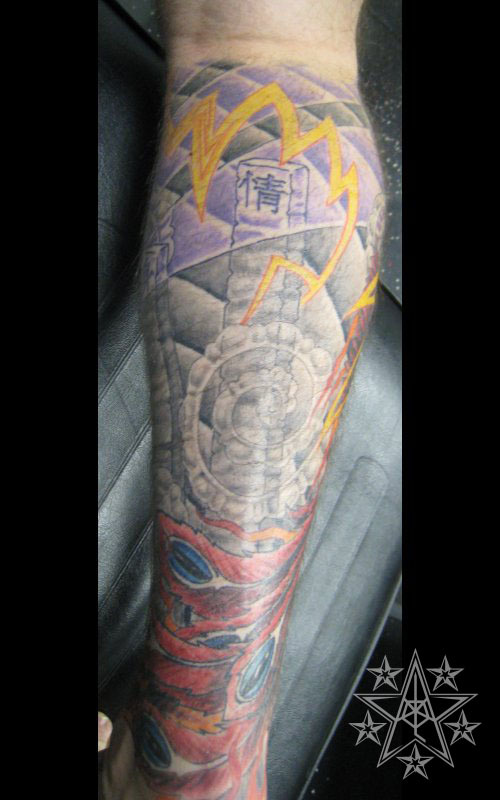 Phoenix Stones 02 Asian phoenix with lightning, clouds, pillars, and light rays calf tattoo. Phoenix Stones 03 Asian phoenix with lightning, clouds, pillars, and light rays calf tattoo. 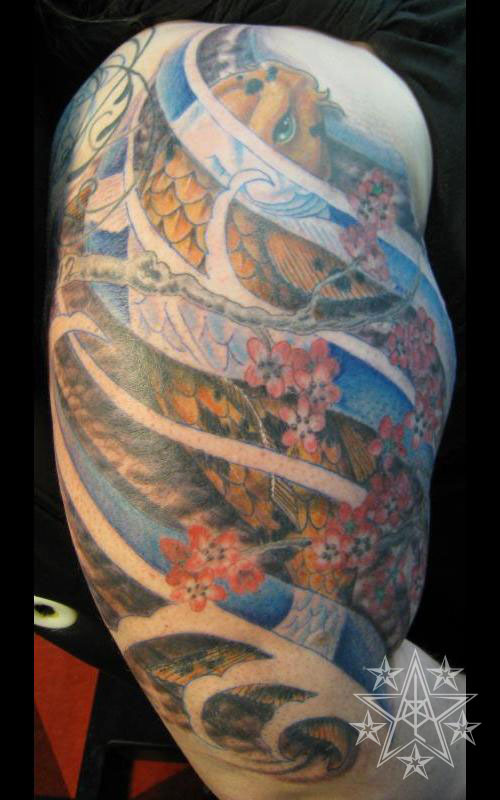 The Quest Upward swimming koi with cherry blossoms tattoo. 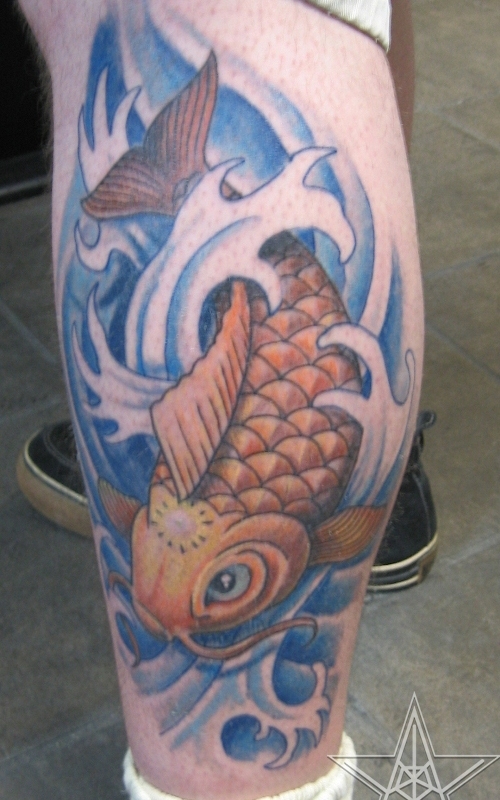 Koi water Upward koi with splashing watter tattoo. 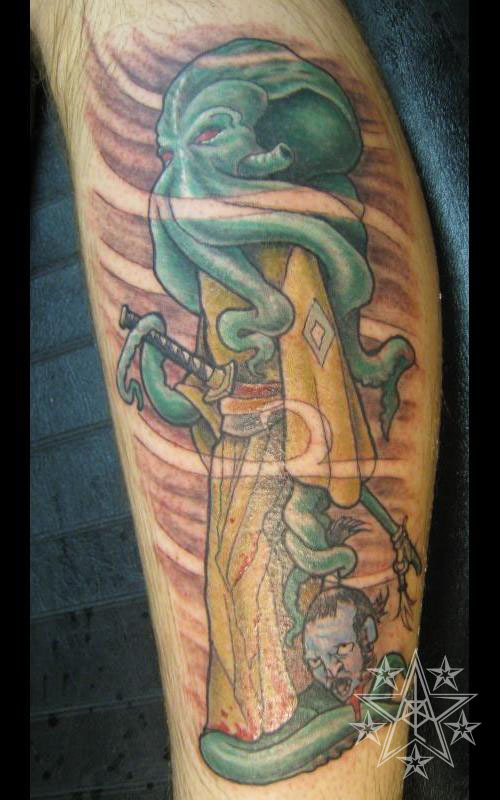 Octo Samurai Octopus Samurai tattoo. 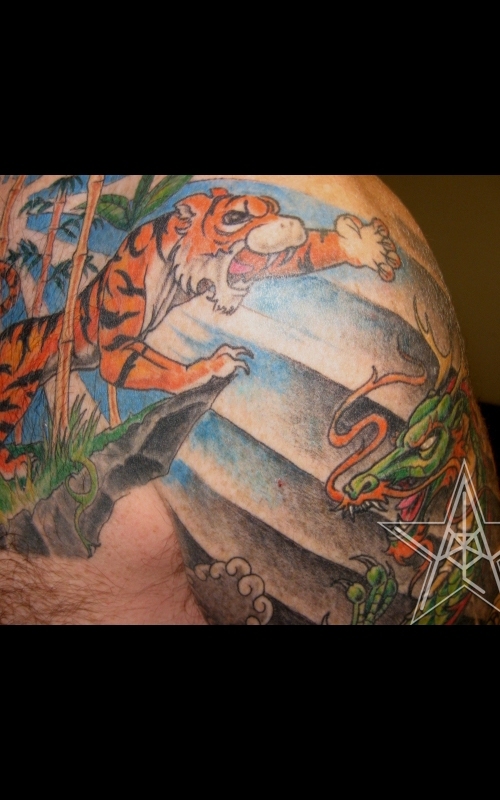 Asian tattoos by Ray Reasoner Jr.
Asian: A very distinct tattooing style from the orient that would include topics from China, Korea, Japan, Thailand, Vietnam, so on and so forth. There can be variances from country to country but there are also some constants between them. There is almost always some story, legend, or religious icon worked into the design. There is generally some form of element (earth, air, water, fire) used to tie the larger designs together. 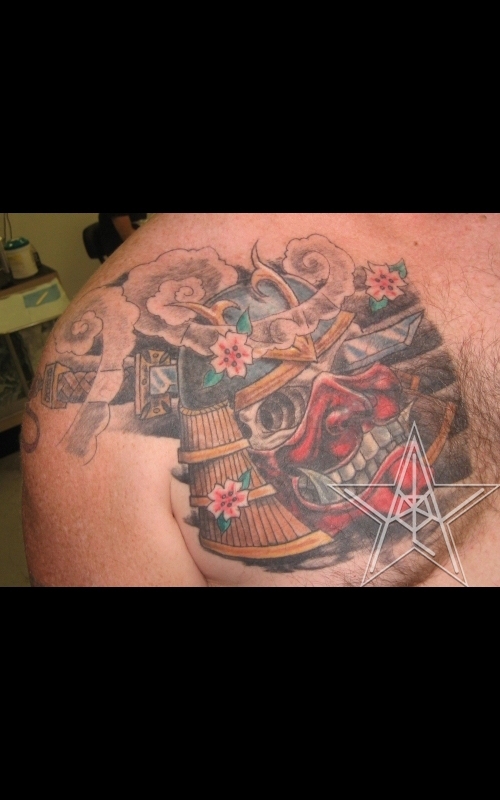 Asian tattoos are quite often identifiable at a distance by the swirling clouds and/or dark black wind panels. They are traditionally very clean in appearance and have very defining lines in the main topics. Of course nowadays Asian tattoos are being done in many different styles as well as the traditional. In the past, and by a handful of people today, they were done by hand using a long rod with needles affixed to them. Bamboo: One of the Four Gentlemen representing summer. Bamboo symbolizes a gentleman with perfect virtues, these being upright integrity with accommodating flexibility, balance and strength. Cherry Blossoms: These are one of the few flowers that fall before they wilt. This blossom symbolizes living a full life rather than withering away into nothing. To die in battle or for one's honor is a great statement. Often translated as good luck but I believe this to tie into the full life aspect of the meaning more so than the rest of it. Chrysanthemum: Symbolizes autumn and henceforth are related to lamentation and grief. The Chrysanthemum is one of the Four Gentleman from Chinese artwork. Dragons: Great serpentine dragons with the mane of a lion, claws of an eagle, horns of an elk, eyes of a demon, belly of a clam, scales of a koi, soles of a tiger, innards of a tortoise, and obviously the torso of a snake. They hold many powers but are quite often attributed as cloud makers and controllers of water. Their scales are said to carry the essence of the yin and yang. 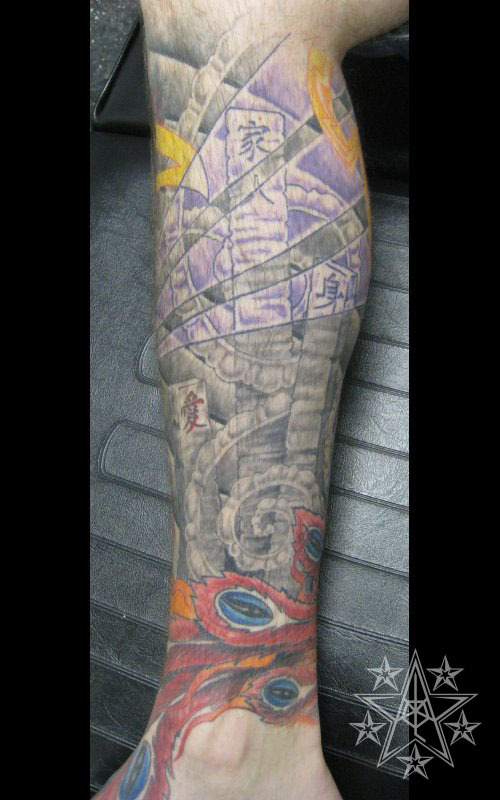 117 in total 81 yang and 36 yin, though in tattoos you can never see the total number of scales. The Chinese dragon has five toes on each foot, while the Korean has four, and the Japanese has three. These different cultures disagree on where the dragon originated and whether the breed gained or lost toes in whatever direction it migrated. Hitotsume-Kozou: A one-eyed goblin, literally has a large eye in the center of its face. It looks like the shaved head of a priest. It does not play tricks, but just scares people. Kappa: Kappa are supernatural creatures which live both on land and in water. They are as tall as a four or five year old child. They have a beak-like snout, and fins on their hands and feet. They also have a shell on their back, and a water-filled dish on their head. As long as the dish is full of water, kappa keep their supernatural powers. Kappa are known for dragging people into the water and pulling out their livers through their anuses. Kitsune: The Kitsune is a magical fox. They have shapeshifting abilities after reaching a minimum of fifty years of age. They most commonly become beautiful women, young girls, or elderly men. As a common prerequisite for the transformation, the fox must place reeds, a broad leaf, or a skull over it's head. They are typically tricksters of the greedy, boastful, while some are just flat out cruel. They are kind of diverse in nature since they are also portrayed as scorned lovers in some stories. Koi: The koi fish greatly represents the human condition. Just as we should attempt to learn and grow so that we may become greater ppl the koi of legend spends it's life attempting to find wisdom and knowledge while swimming upstream. If it actually gains the knowledge (symbolized by a glowing ball of light on the forehead) it must then swim to the dragon gate and jump over it. Once overcoming that hurdle it ascends into the higher form of the dragon. So, as with humans, if we do not overcome the hurdles in our life we will remain bottom feeders rather than climbing to the heavens. Oni: Oni are demons. They are not necessarily evil, but more so than not they are not the nicest creatures in the room. They can be protectors as well. This is usually determined by the color of the oni as well as the context in which it is portrayed. Orchid: Represents spring, and therefore healing and rebirth to some degree. This member of the Four Gentlemen symbolizes nobility and honor since they release their beauty regardless of who is nearby. This mirrors someone that creates beauty or keeps their morals regardless of the situation. Peony: The peony is symbolic of wealth. This wealth is not necessarily a material wealth as much as an overall prosperity for a unified group working toward a common wealth of happiness. Plum Blossom: Symbolizes winter, the coming of spring, strength and perseverance. This flower blooms mid-winter after all others have died and before any others bloom. It is one of the Four Gentlemen in Chinese art. Rokurokubi: Female monsters with long, flexible necks. They look just like ordinary humans during the day, but at night, they extend their necks to frighten or spy on people. They sometimes turn their human faces into those of demons. Tengu: Although they take their name from a dog-like Chinese demon (Tiangou), the tengu were originally thought to take the forms of birds of prey, and they are traditionally depicted with both human and avian characteristics. The earliest tengu were pictured with beaks, but this feature has often been humanized as an unnaturally long nose, which today is practically the tengu's defining characteristic in the popular imagination. Warriors: There are a plethora of legends about spectacular victories and formidable opponents. These images are usually meant as homage to the story or as a means of sharing the power of the hero represented. Yin Yang: The yin-yang is a symbol of balance. Dark and light, good and evil, pretty much any opposite forces may be used to form a yin yang but it is traditionally a circle with equal curving teardrops of black and white with circles of the opposite color within those teardrops. These circles may symbolize that there can be good within evil and evil within good but I am not certain of that. Yuki-Onna: A snow woman, appears in a white kimono on a stormy night. She causes travelers to become lost and freeze to death. Click here to read the story of "Yuki-Onna" by Lafcadio Hearn (Koizumi Yakumo). Yurei: Ghosts that are still among the living for a reason. Generally to avenge a wrongdoing of some sort. They are usually more like western ghosts by description, they look fairly human still and are transparent.